Built on agricultural traditions, Campo Grande has grown rapidly, from a rural village in 1875 to a thriving metropolis of more than 800,000 people. On the 29th (Tue), examine the collection at Dom Bosco Culture Museum and then examine the collection at Image and Sound Museum. To see other places to visit, where to stay, ratings, and other tourist information, use the Campo Grande trip itinerary builder website . Uberlandia to Campo Grande is an approximately 6-hour flight. You can also drive; or take a bus. The time zone changes from Brasilia Time to Amazon Time, which is usually a -1 hour difference. In January, daily temperatures in Campo Grande can reach 35°C, while at night they dip to 24°C. Wrap up your sightseeing on the 29th (Tue) early enough to travel to Cuiaba. On the 30th (Wed), contemplate in the serene atmosphere at Capela Santa Rita de Cassia Centro, view the masterpieces at N...art"s, then brush up on your military savvy at Museu da PMMT Cel. PM RR Ubaldo Monteiro da Silva, then see the interesting displays at Sesc Casa do Artesao, and finally explore the world behind art at Serviço Social do Comércio-SESC-Arsenal. Get ready for a full day of sightseeing on the 31st (Thu): explore the wealth of natural beauty at Chapada dos Guimaraes National Park and then contemplate the long history of Our Lady of Rosario and Sao Benedito Church. For other places to visit, reviews, more things to do, and tourist information, you can read our Cuiaba online itinerary builder . Fly from Campo Grande to Cuiaba in 3.5 hours. Alternatively, you can take a bus; or drive. In January in Cuiaba, expect temperatures between 36°C during the day and 26°C at night. Wrap up your sightseeing on the 31st (Thu) to allow time to travel to Porto Velho. Not a feature on most tourist itineraries, Porto Velho can make an interesting stop when headed to Manaus by riverboat. On the 1st (Fri), get great views at Memorial Rondon, o Marechal da Paz, then see the interesting displays at Museu Internacional do Presepio, then get outside with Rio Preto, and finally pause for some serene contemplation at Catedral Sagrado Coracao de Jesus. To find maps, ratings, other places to visit, and more tourist information, go to the Porto Velho trip planner. Getting from Cuiaba to Porto Velho by flight takes about 3.5 hours. Other options: drive; or take a bus. In January, plan for daily highs up to 35°C, and evening lows to 27°C. Finish your sightseeing early on the 1st (Fri) to allow enough time to travel to Rio Branco. Start off your visit on the 2nd (Sat): examine the collection at UFAC University Acervos Museum, examine the collection at Panteology Museum, don't miss a visit to Bosque Market, then look for all kinds of wild species at Parque Ambiental Chico Mendes, and finally take in the architecture and atmosphere at Catedral Nossa Senhora de Nazare. For other places to visit, ratings, where to stay, and tourist information, refer to the Rio Branco trip builder site . Getting from Porto Velho to Rio Branco by flight takes about 2.5 hours. Other options: take a bus. Traveling from Porto Velho to Rio Branco, you'll gain 1 hour due to the time zone difference. Expect a daytime high around 34°C in February, and nighttime lows around 26°C. Finish your sightseeing early on the 2nd (Sat) to allow enough time to travel to Manaus. It's hard not to get excited when planning a trip to Manaus, capital of the state of Amazonas, and the largest city on the mighty Amazon River. On the 3rd (Sun), see the interesting displays at Manaus Botanical Garden - MUSA, then learn more about the world around you at Museu da Amazonia (MUSA), and then pause for some serene contemplation at Church of Sao Sebastiao e Sao Francisco de Assis. Get ready for a full day of sightseeing on the 4th (Mon): get a dose of the wild on a nature and wildlife tour. To find where to stay, reviews, ratings, and tourist information, use the Manaus online sightseeing planner . Traveling by flight from Rio Branco to Manaus takes 5 hours. Alternatively, you can take a bus; or do a combination of bus and ferry. Due to the time zone difference, you'll lose 1 hour traveling from Rio Branco to Manaus. In February, daily temperatures in Manaus can reach 34°C, while at night they dip to 27°C. Cap off your sightseeing on the 4th (Mon) early enough to travel to Boa Vista. Start off your visit on the 5th (Tue): explore the striking landscape of Parque Nacional do Monte Roraima. To see more things to do, where to stay, other places to visit, and tourist information, read our Boa Vista trip planner. Explore your travel options from Manaus to Boa Vista with the Route module. In February in Boa Vista, expect temperatures between 38°C during the day and 28°C at night. Wrap up your sightseeing on the 5th (Tue) early enough to travel to Belem. Start off your visit on the 6th (Wed): pause for some serene contemplation at Basilica de Nossa Senhora de Nazare, examine the collection at Museu Paraense Emilio Goeldi, examine the collection at Para Religious Art Museum, then pause for some serene contemplation at Belem Metropolitan Cathedral, then steep yourself in history at Forte do Presepio, and finally explore the world behind art at Espaco Cultural Casa das Onze Janelas. To see maps, ratings, and tourist information, refer to the Belem tour planning website . Use the Route module to find suitable travel options from Boa Vista to Belem. Due to the time zone difference, you'll lose 1 hour traveling from Boa Vista to Belem. Expect a bit cooler weather when traveling from Boa Vista in February: highs in Belem hover around 34°C, while lows dip to 27°C. Finish your sightseeing early on the 6th (Wed) to allow enough time to travel to Macapa. The equator cuts right through Macapa, giving the town the playful moniker of "The Capital of the Middle of the World." The city is accessible by air and sea; it sits along the Amazon River very near where it reaches the Atlantic Ocean. Kick off your visit on the 7th (Thu): pause for some serene contemplation at Sao Jose de Macapa Church, make a trip to Fortaleza de Sao Jose de Macapa, stroll through Praca Floriano Peixoto, then examine the collection at Museu do Desenvolvimento Sustentavel, and finally examine the collection at Centro de Pesquisas Museologicas Sacaca Museum. 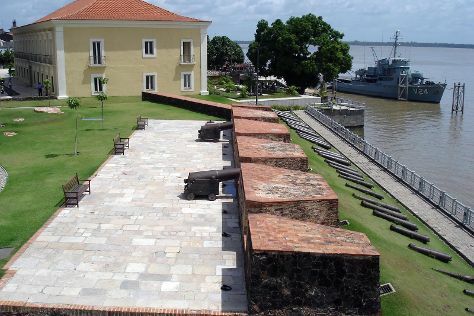 To find out how to plan a trip to Macapa, use our trip itinerary maker. Traveling by flight from Belem to Macapa takes 2.5 hours. Alternatively, you can ride a ferry. In February, plan for daily highs up to 36°C, and evening lows to 27°C. Wrap up your sightseeing on the 7th (Thu) to allow time to travel to Sao Luis. On the 8th (Fri), see the interesting displays at Casa da Festa, examine the collection at Museu de Artes Visuais, examine the collection at Museu do Reggae, take in the architecture and atmosphere at Se Church, then contemplate the long history of Palacio dos Leoes, and finally contemplate the long history of Centro Histórico. Get ready for a full day of sightseeing on the 9th (Sat): tour the pleasant surroundings at Itatinga Beach, pause for some serene contemplation at Igreja de Nossa Senhora dos Rosarios dos Pretos, then admire the masterpieces at Museu Historico e Artistico do Maranhao, then take an in-depth tour of Casa de Cultura Huguenote Daniel de La Touche, and finally see the interesting displays at Centro Cultural Vale Maranhao - CCVM. For traveler tips, where to stay, and more tourist information, use the Sao Luis vacation maker tool . You can fly from Macapa to Sao Luis in 5 hours. Alternatively, you can do a combination of ferry and bus. In February in Sao Luis, expect temperatures between 36°C during the day and 28°C at night. Finish up your sightseeing early on the 9th (Sat) so you can travel to Teresina. On the 10th (Sun), pause for some serene contemplation at Igreja Sao Benedito, pause for some serene contemplation at Paroquia de Sao Jose Operario, then get outside with Nova Potycabana, and finally see the interesting displays at Casa de Sao Jose Interactive Science Center. To find other places to visit, photos, and other tourist information, go to the Teresina online trip itinerary builder . You can do a combination of bus and flight from Sao Luis to Teresina in 3 hours. Alternatively, you can drive; or take a bus. Expect a daytime high around 38°C in February, and nighttime lows around 28°C. Wrap up your sightseeing on the 10th (Sun) early enough to travel to Fortaleza. Visiting Morro Branco and Praia de Futuro will get you outdoors. You'll discover tucked-away gems like Porto das Dunas Beach and Aguas Belas Beach. 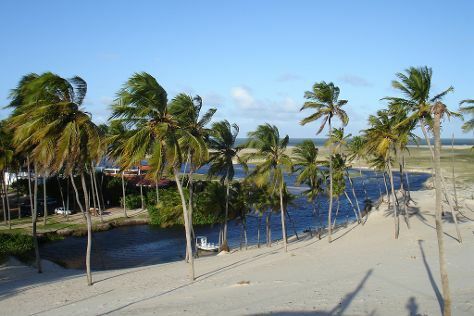 Step out of Fortaleza to go to Caponga and see Aguas Belas Beach, which is approximately 1h 20 min away. There's more to do: kick back and relax at Iracema Beach. For more things to do and other tourist information, read Fortaleza trip planner . Getting from Teresina to Fortaleza by flight takes about 3 hours. Other options: drive; or take a bus. While traveling from Teresina, expect little chillier days and about the same nights in Fortaleza, ranging from highs of 35°C to lows of 29°C. Wrap up your sightseeing on the 13th (Wed) early enough to travel to Natal. Satisfy your inner culture vulture at Clidenor de Lima Galvao Museum and Metropolitan Cathedral. Take a break from the city and head to Cotovelo Beach and Ponta Negra Beach. Get out of town with these interesting Natal side-trips: Barra de Cunhau (in Canguaretama), Lagoa de Carcara (in Nisia Floresta) and Cowboy's Museum (in Sao Jose de Mipibu). There's lots more to do: kick back and relax at Barra De Punau, see the vivid underwater world at Parrachos de Maracajau, admire all the interesting features of Arena das Dunas, and sample the tasty concoctions at Cervejaria Via Continental. To see traveler tips, where to stay, more things to do, and other tourist information, refer to the Natal trip planner . You can fly from Fortaleza to Natal in 3.5 hours. Alternatively, you can drive; or take a bus. February in Natal sees daily highs of 36°C and lows of 28°C at night. Finish up your sightseeing early on the 17th (Sun) so you can go by car to Joao Pessoa. Relax by the water at Praia de Tambaba and Praia do Jacare. You'll discover tucked-away gems like Camboinha Beach and Estacao Cabo Branco. You'll find plenty of places to visit near Joao Pessoa: Conde (Praia da Barra do Graú, Tabatinga Beach, & more). To find traveler tips, where to stay, more things to do, and tourist information, read our Joao Pessoa trip maker . Getting from Natal to Joao Pessoa by car takes about 2.5 hours. Other options: do a combination of bus and train; or take a bus. In February, plan for daily highs up to 36°C, and evening lows to 27°C. Cap off your sightseeing on the 20th (Wed) early enough to travel to Palmas. A freshly founded city in the state of Tocantins, Palmas finds itself nestled between Amazon rainforest and seaside savanna, giving the city a varied landscape. On the 21st (Thu), get great views at Pedra da Neura, admire the sheer force of Ecologica Falls, and then admire the sheer force of Roncador Waterfall. Here are some ideas for day two: head off the coast to Ilha Canela and then admire the majestic nature at Realize Viagens e Turismo. For maps, where to stay, other places to visit, and other tourist information, you can read our Palmas trip planner . You can fly from Joao Pessoa to Palmas in 6 hours. Alternatively, you can drive; or take a bus. In February, daytime highs in Palmas are 36°C, while nighttime lows are 26°C. Wrap up your sightseeing on the 22nd (Fri) early enough to travel to Goiania. You'll explore and learn at Wheels of Time Antique Motorcycle and Atelie Da Filigrana. Your inner history buff will appreciate Centro Historico de Pirenopolis and Our Lady of Rosario church. Change things up with these side-trips from Goiania: Pirenopolis (Mariano de Pirenopolis Museum, Cachoeira do Abade, & more). There's more to do: explore the galleries of Oscar Niemeyer Cultural Center. For traveler tips, maps, photos, and more tourist information, use the Goiania online vacation planner . Fly from Palmas to Goiania in 3.5 hours. Alternatively, you can take a bus; or drive. Traveling from Palmas in February, you can expect nighttime temperatures to be slightly colder in Goiania, with lows of 23°C. Cap off your sightseeing on the 26th (Tue) early enough to go by car to Brasilia. Kick off your visit on the 27th (Wed): explore the wealth of natural beauty at Brasilia National Park and then admire the striking features of Catedral Metropolitana. Keep things going the next day: take in the waterfront at Pontao do Lago Sul, contemplate the waterfront views at Lago Paranoa, then pause for some serene contemplation at Igrejinha N.S. De Fatima church, and finally take in the architecture and atmosphere at Paroquia Nossa Senhora de Fatima. To see where to stay, other places to visit, more things to do, and tourist information, you can read our Brasilia vacation maker . Getting from Goiania to Brasilia by car takes about 3 hours. Other options: take a bus; or fly. Expect a daytime high around 32°C in February, and nighttime lows around 21°C. Finish your sightseeing early on the 28th (Thu) so you can travel back home.